In a recent BGR interview with Nokia CEO Stephen Elop, much ground was covered on the future of the Nokia-Microsoft partnership. 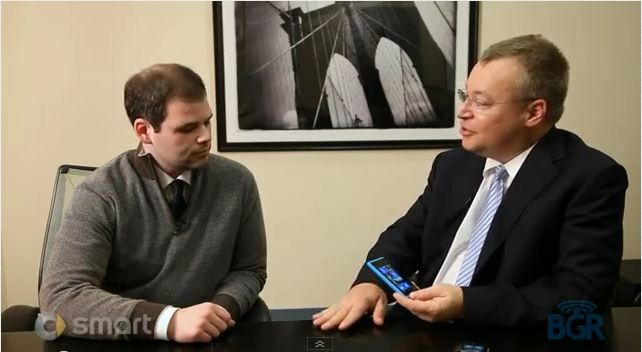 What this partnership will bring, along with a small preview of the new Nokia Lumia 800 and Lumia 710 devices, is what Elop brings to the table in this interview. Elop discusses how their already released Nokia devices are innovative to the Windows Phone community and definitely provide a unique experience only the Nokia-Microsoft partnership can bring. Elop refers these small experiences as “differentiators” in regards to other devices out on the market. Nokia has entered into a partnership with ESPN, for example, to provide an experience that will only be available to Nokia Windows Phone devices, no other platform, ever. The Nokia Lumia 800 differentiators include location based services, entertainment, sports and more. The Nokia Lumia 710 has all those same differentiators but at a slightly lower price point targeted for economic consumer. The Nokia Drive application is an example of unique experiences worked on together with Microsoft to introduce something different and an improvement to the Windows Phone platform, only available on Nokia devices. Nokia has made a commitment to bring their best work to the Windows Phone platform and commmunicate on a day to day basis with Microsoft to make perfect products. Nokia provides its side of improvements that they feel is important to add to the Windows Phone experience during meetings, and Microsoft listens closely. However, the competition for Nokia is not other Windows Phone manufacturers, but solely Apple and Android devices. The Nokia-Microsoft partnership was very specific in providing an innovative and game-changing experience to future Windows Phone devices, and protecting that ecosystem all together. Elop emphasizes that there are many patent and Microsoft exclusive agreements that were made with the recent partnership announcement, and that they will definitely bring attention to Windows Phone devices in the future. Really? Where is? 2 Windows Phone without facing camera?? I don’t see nothing new in this phone of Nokia Company. Only Lumia 710 than have a great design.